A burndown chart is a line chart drawn between "work remaining" and "time". These charts are used by scrum teams to track their progress as they “burn through” tasks in a sprint. Burndown charts are fairly simple to understand but teams often struggle to understand the full meaning behind the graph. The X axis of the chart always indicates time (usually in days). The y axis represents the remaining work to be done in the sprint. This may be represented by either Tasks Remaining (in # of tasks) or Remaining Effort (in Story Points/Hours). The progress line indicates how your team is progressing with their sprint. It gets updated every day with the new remaining estimates. As the sprint progresses, this line will indicate whether your team is on track and if any corrective action is needed. This is a diagonal line drawn downwards, from left to right on the graph. Your sprint progress line should ideally be as close to the guideline as possible. If your team is able to complete all stories at a steady pace throughout the sprint, your progress line will end up looking exactly like the guideline. This is a plot of how many tasks remain in the sprint at any given date. As tasks are completed across time, the progress line starts moving downwards. The biggest advantage with this method is that the graph is easy to understand. 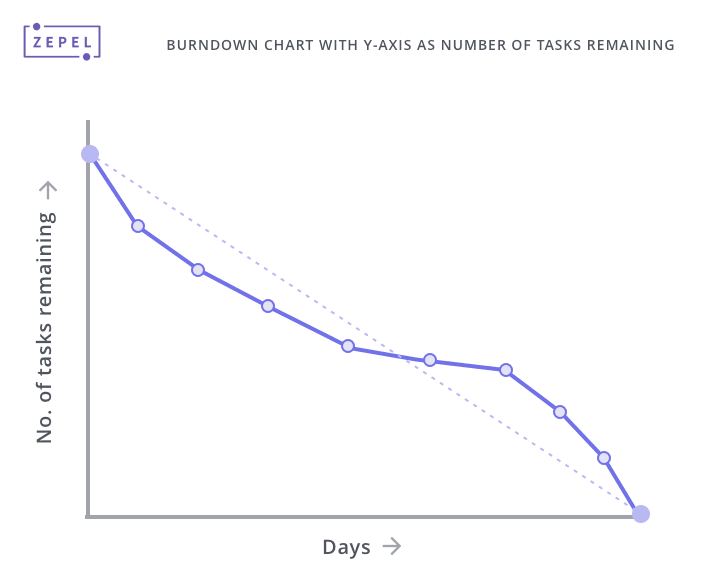 The drawback of using this type of burndown chart is that tasks are not estimated. Not all tasks take equal effort to complete. Very often, teams which leave the difficult tasks for the end of the sprint find that they are unable to complete all tasks despite being “on track” for most of the duration. This is a plot of how many story/estimate points remain as time progresses. Story points are a great way to estimate tasks by their complexity. This normalizes effort needed to complete tasks. The plot ends up similar to the previous method but estimate points remove the ambiguity that comes with tracking task completion. When is a burndown chart useful? 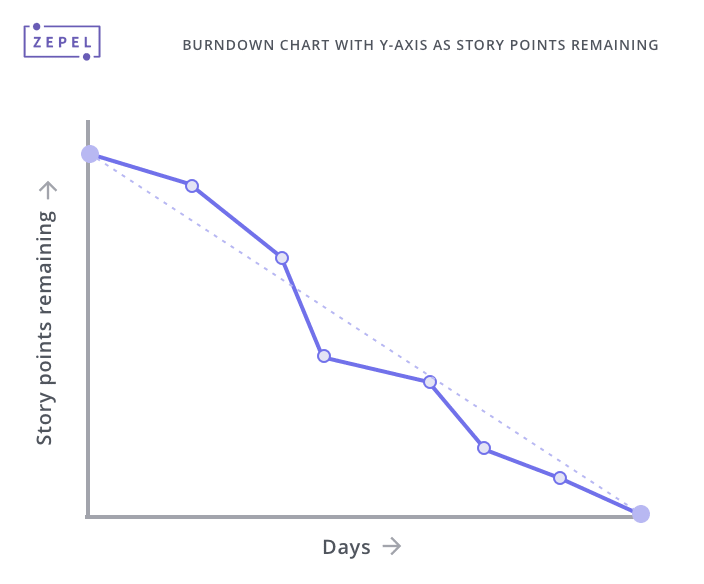 Burndown Charts are useful during both: active sprints and sprint retrospectives. Is the sprint progress on target? Will all stories (or tasks) be completed on time? What corrective action needs to be taken to hit targets? 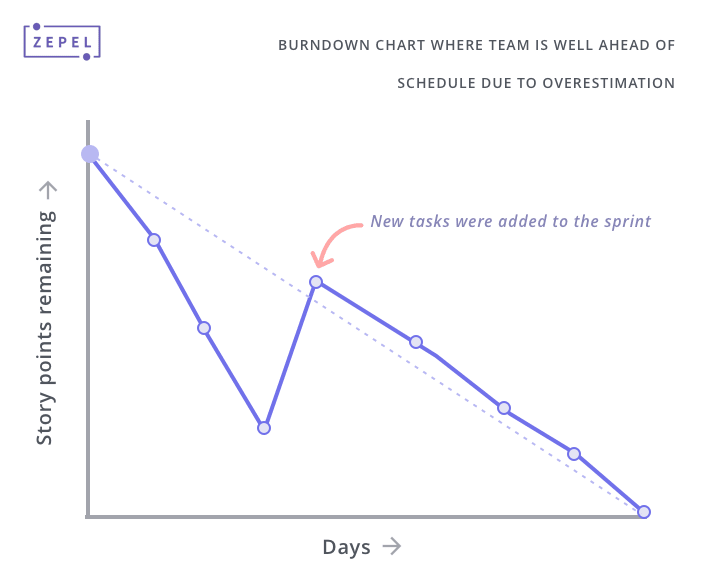 Burndown Charts are an indicator of a Sprint team’s performance. 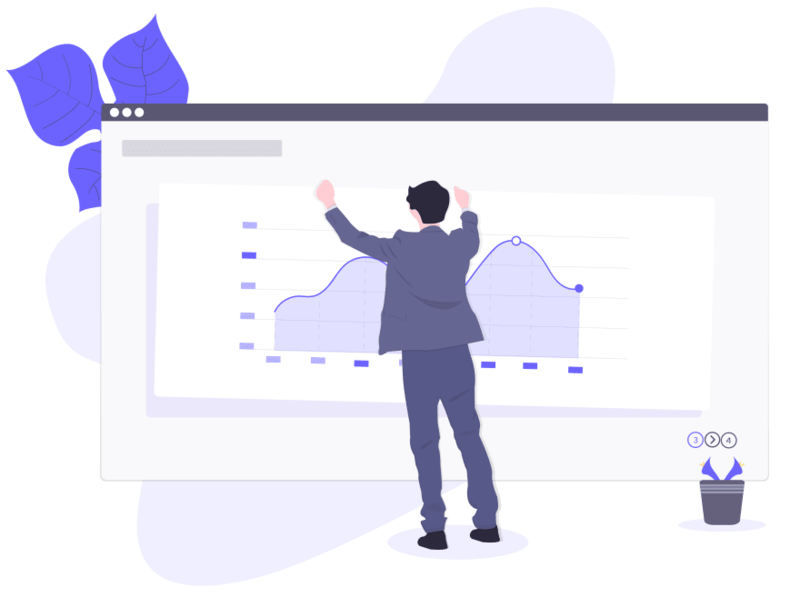 During a sprint retrospective, burndown charts serve as a reference for discussions around estimation accuracy, sprint performance, roadblocks and changes to be made during subsequent sprints. 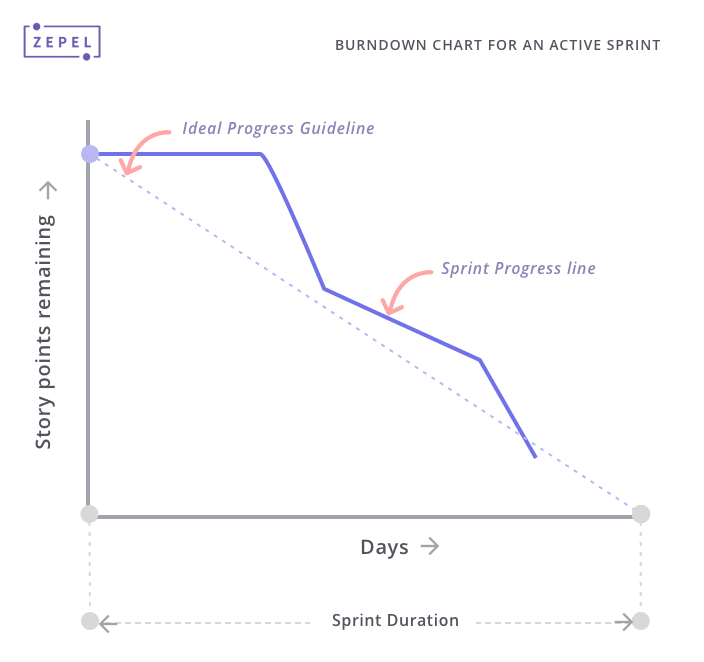 The Burndown Graph is read by comparing the sprint progress line to the guideline. The closer the two lines are to each other, the better your chances are of completing all tasks by the deadline. 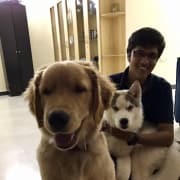 Behind schedule: If the progress line is above the guideline, it means your team is behind schedule and should have ideally completed more work by this point. On track: The progress line and the guideline are close together. The team will hit targets if they maintain their current velocity. Ahead of schedule: The progress line is below the guideline. The team is on track to hit targets even before the sprint's end date. This may be because the tasks were overestimated while planning the sprint. The team can add more tasks to the sprint to ensure everyone is occupied throughout the sprint. Here are some common patterns you are likely to observe while using burndown charts to track sprints. Teams that update their statuses in chunks ( at the end of every week for example) end up with a stepped graph. Regular status updates give a more accurate graph. Ideally, Sprint teams should keep their tasks updated on a daily basis. A stepped graph is also sometimes the result of improper breakdown of tasks. 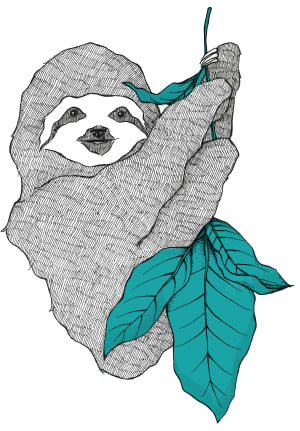 If tasks are not broken down enough, individual issues may take a long time to complete: leading to an illusion of a lack of progress over several days. The best way to avoid this is to break down large tasks into small executable chunks of work. This is the burndown chart of a team that updates all their statuses a day before the sprint review meeting. 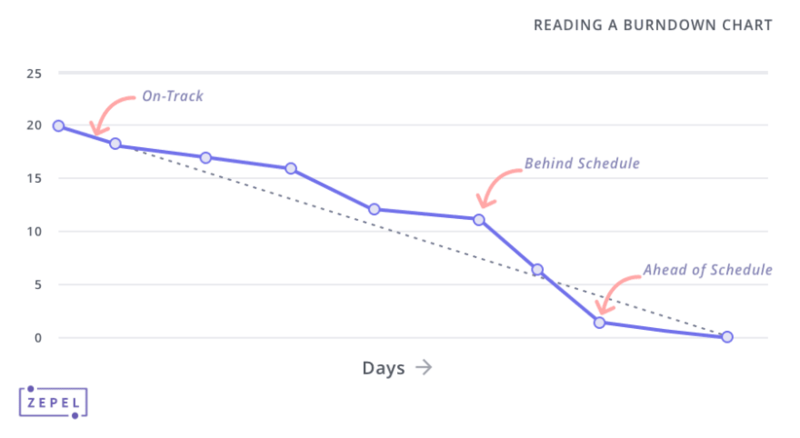 This chart adds very little value during a retrospective and teams should make sure their statuses are updated daily. This graph represents a team that overestimated the time it would take to complete tasks. If this team maintains their current velocity, they will end up completing all tasks well before the sprint end date. 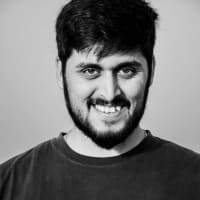 The product owner needs to add more tasks to the sprint (represented by the steep rise in the estimate), in order to keep the team busy for the entire duration of the sprint. This is the burndown graph of a team that is struggling to keep up with the ideal guideline. Reduce the scope of the sprint by removing stories or tasks. 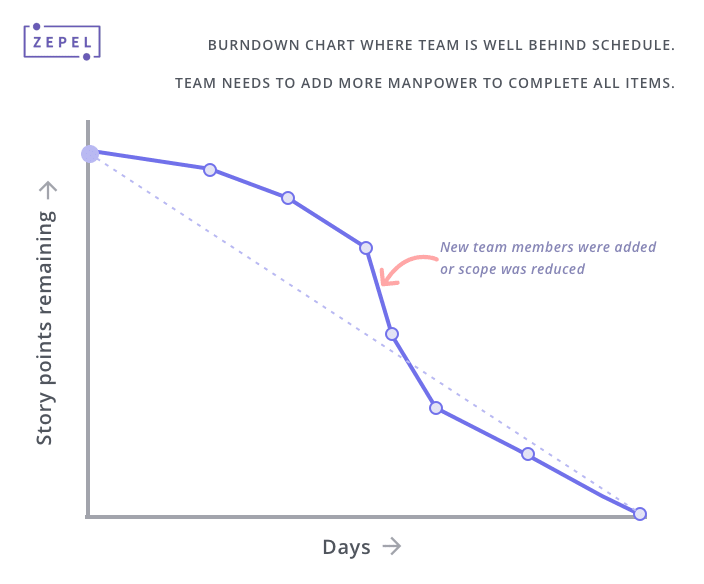 The Burndown Chart doesn’t actually tell you how much work is being completed by the team: While the burndown chart talks about how much work is remaining, it doesn’t actually talk about how much work is being done. This data can be visualized in the form of a burnup chart, which is nothing but an inverted burndown. Burndowns can be used for sprints only: Burndown charts don’t make much sense when they are not timeboxed. Over a long duration, the backlog goes through too many changes for remaining estimates to make much sense. This is why burndown charts aren’t recommended for Agile teams practicing Kanban methodology. 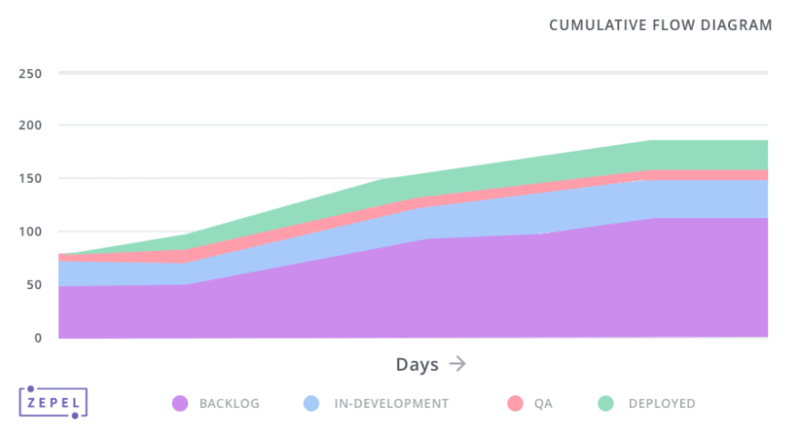 It can be difficult to capture scope changes and visualize a changing backlog: As discussed above, changes in the backlog size are not captured effectively on a burndown chart. One workaround would be to add more data to the chart but this affects the readability of the graph. 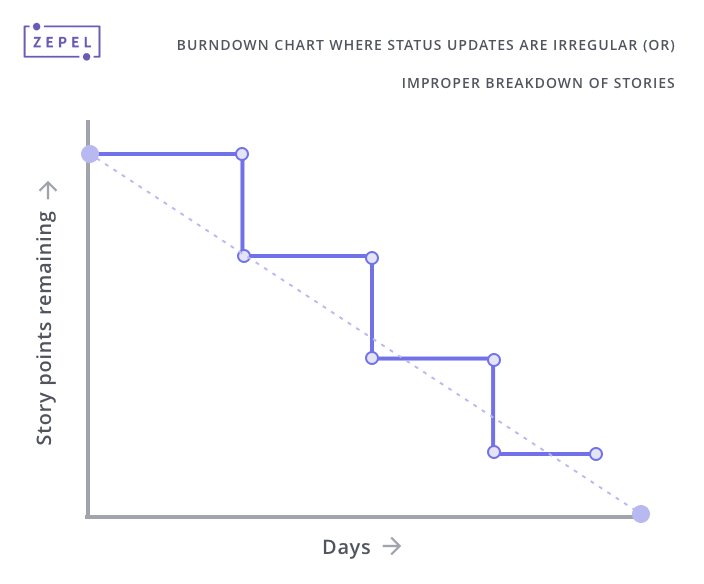 These limitations of the burndown chart can be overcome by using a Cumulative Flow Diagram. The Burndown graph doesn’t account for “in progress” status changes: Burndown Charts focus on completion of issues. Status changes during the “in progress” state aren’t captured on the burnup chart. This can often lead to the illusion that no progress is being made by the team. To account for changes in status of items in progress, cumulative flow diagrams or control charts can be used. Burndown Charts are a great way to visualize a sprint’s progress. Like all tools, scrum masters and product owners should follow a few rules to ensure that they can derive full value from Burndown Charts. Spend sufficient time breaking down user stories and estimating them. 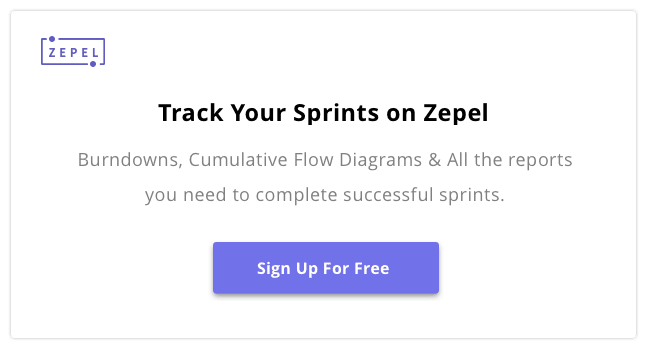 Ensure you are tracking the right metric for sprint progress. Encourage your team to update statuses for their tasks as and when they complete them. 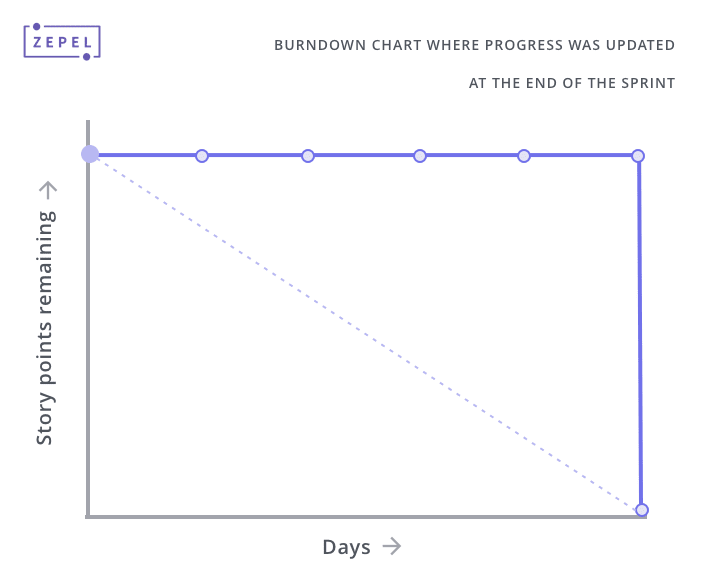 Use the burndown chart for your daily standup. Wait for a few days to spot patterns before taking any corrective measures.